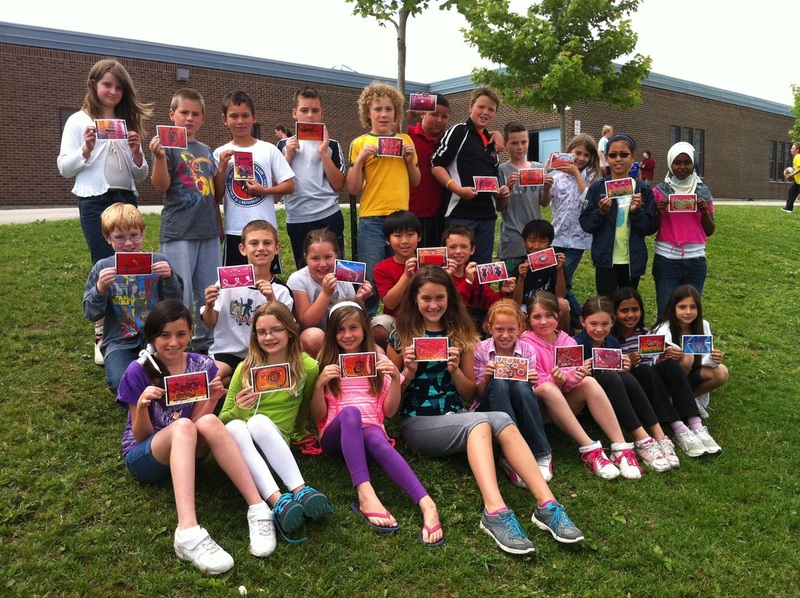 In June 2012, my class of grade four students at Emily Carr Public School in London, ON completed a very unique art lesson. The students were engaging in an Australian theme day and one highlight was to create authentic looking Australian aboriginal dreamtime paintings. The students viewed pictures of dreamtime paintings, were told stories of aboriginal myths and studied the colours and creatures of the Uluru landscape. This region, in the heart of the country known as The Red Center, carries much spiritual significance. 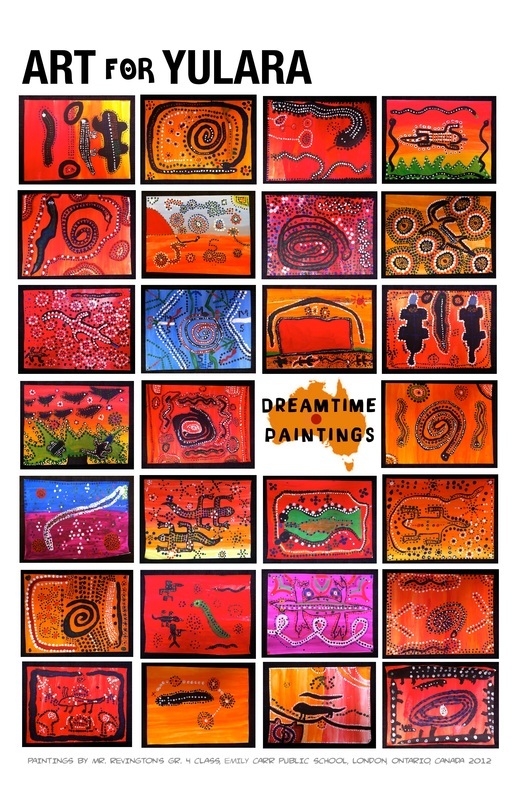 Dreamtime paintings are different from regular indigenous paintings as the figures they depict are dotted. This feature distinguishes them from real creatures and allows the artist to connect to the true spirit of the land. Once I had provided the instructions for the task, I asked the students to find an open space on the class carpet to lie down. We turned down the lights and I asked them to clear their minds of all thoughts and to imagine a large, white screen. They were relaxed on the floor and were instructed to take deep breaths in, and then out. I asked them to imagine themselves lying down on the warm, ocher soil around Ayers Rock, a place they had just learned about in my media presentation. This creative visualization exercise let them sense the warmth, colours and most importantly, the awareness of the spirit animals that came to greet them while they relaxed. They imagined creatures, patterns and colours and how they may look on their paintings, then they slowly made their way back to their tables to create. 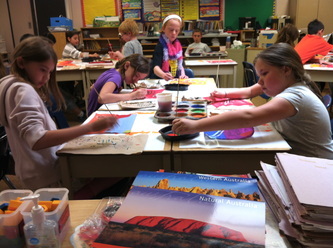 It was important for the students to make this connection, to honour the aboriginal spirit that is the essence of this type of art. There was a quietness in the room that only emanates from a truly focused team of artists. With water colours and broad brushes they painted a background of blended colours. Once these had dried they began using the blunt ends of wooden skewers and cotton swabs to create their imagined designs using acrylic paints. 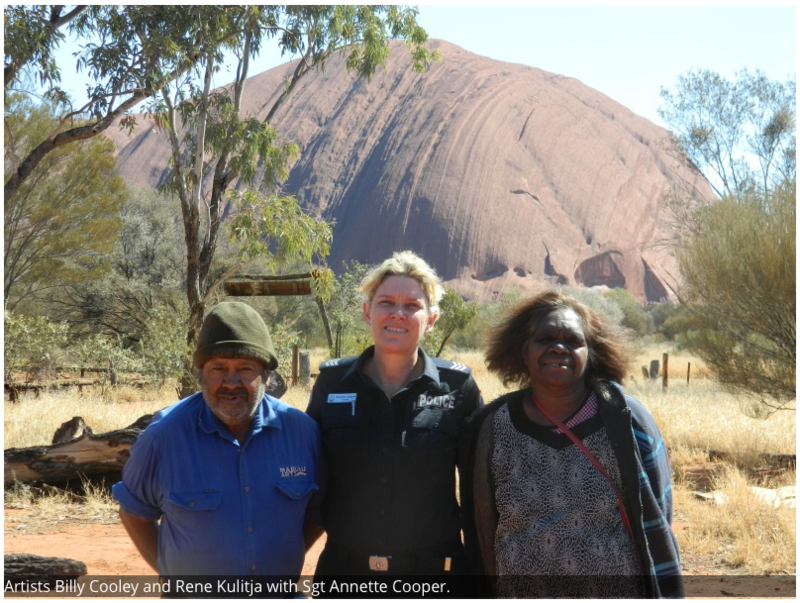 Sergeant Annette Cooper, Yulara Police Stn. As I watched the dedicated students create, I wondered what the Australians of the Yulara area would think about their art and culture coming alive in a grade four classroom in Ontario on the opposite side of the world? I've learned to act on some of these wonder moments and this would be one of those times. I made some inquiries to see if there may be interest in the Ayers Rock area where we could share our artwork. I contacted Sergeant Annette Cooper at the Yulara Police Station and that's when the wonder moment turned into a journey. Sergeant Cooper promised to make some calls and assured me that there would be interest. A few weeks later she emailed to say that she had contacted the Maruku Community, and a group of well known aboriginal artist from the area, that would be interested in judging our paintings. 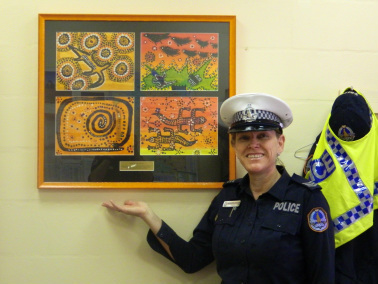 Sergeant Cooper also shared that they would select the top four student paintings and they would be framed and hung at the Yulara Police Station. The other student paintings would be shared within the community. What a wonderful bonus! Before I sent our originals to Australia, I took photos of all the student's artwork so that each student would have a copy to keep. A few weeks later I learned that the paintings arrived safely at Yulara, NT. 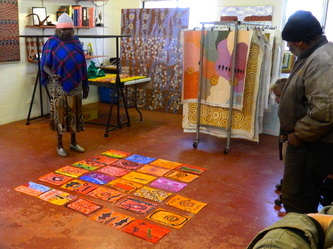 We also received pictures of the Mutijulu artists viewing the paintings on the floor of their community center. 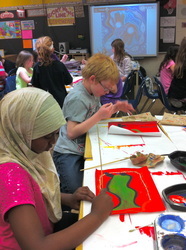 Here we were, watching photos of our class paintings being authentically assessed by the masters of this style of art. A month or so on I received word that four students paintings had been selected. According to the artists at Maruku, Terry Moriarty, Jasmine Kang, Ashley Pearce and Klarissa Stafford had proven to be the best at this creative task. Now, four Canadian student dreamtime paintings hang proudly on a wall of the Yulara Police Station in the outback of the Northern Territory. 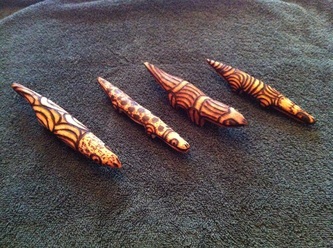 Each student received a hand carved, wooden spirit animal (a punu) made especially by the artists of Mutijulu and paid for by the Yulara Police Station. It was their special way of thanking and congratulating the winners on a job well done. By acting on a simple, 'I wonder moment' I learned how my student's artwork would be accepted by the Australian aboriginals halfway around the world? The answer, a resounding "greatly appreciated". 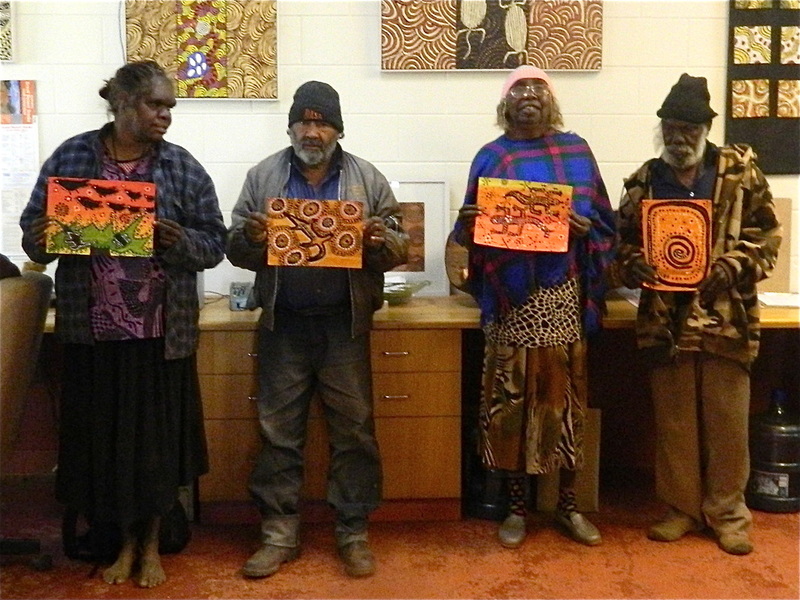 The artists even remarked on how well all the students had connected with their land and how well they grasped the dreamtime designs and art techniques. To appreciate each student's piece of work, I created a poster which included every student painting and I titled it 'Art for Yulara'. I sent a copy to Sergeant Cooper and to the elders in Mutijulu thanking them for their time and interest in our art. As well, our principal Mr. Matt Chevalier wrote an official, school letter to thank them all for their contributions. The exchange was truly an artistic and cultural exchange. Sgt. Cooper sent our story to eDrum, an emergency response online newsletter of the Northern Territory and the story was published. With encouragement from Sgt. Cooper that this story needed to be shared, I contacted the Canadian offices of Australian High Commission. They were extremely pleased to hear about the story and requested an 'Art for Yulara' dreamtime poster so it could be framed and mounted in their office in Canberra. Wow, yet another bonus! Recently, I learned that one of the Maruku artists was approached by a Scottish teacher who heard about our artistic exchange and there's another international exchange in the works. Reaching out beyond the norm can feel uncomfortable, as you never know how your efforts will be received. On the other hand, it can be very rewarding and you never quite know where your adventure will take you. To wonder how the aboriginals would feel knowing that their art and culture was being appreciated on the other side of the planet was the question. With a modest inquiry a beautiful journey entailed and the grade four students are now forever connected to a place that only months ago they'd never heard of. Even if it's only once a year, I try to act on a ‘what if’, I'll inquire about an ‘I wonder’ and try to navigate a class activity beyond the classroom into the real world. When those 'I wonder' moments occur think about acting on them, as a journey can unfold. As an educator you will never regret it and your students - they’ll never forget it! Steve Revington is a pioneer of the authentic learning model of education.